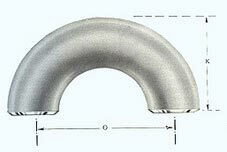 180 Degree Elbow that we offer is manufactured using high grade metals that add durability to the product. It is rust resistant and therefore, is perfect to be used in multitude of industries like petrochemical, steel plant, power plant, mining and many more. Simple to install, our 180 Degree Elbow is high in demand in the market. We customize 180 Degree Elbow as per the requirements specified by the buyers.